Tinariwen are an iconic desert-blues band originally from northern Mali. Rooted in traditional Tuareg music but influenced by the likes of Bob Dylan and Bob Marley, their music addresses political awakening, problems of exile, repression of their people, and demands of sovereignty. Their music has become a rallying point for the disenfranchised nation, while helping to garner global interest in desert blues, a hypnotic, danceable and intense combination of blues, traditional Tuareg music, rock and more. Outlawed in Algeria and Mali, their first two albums, spread to international audiences, and they paved the way for the current wave of Tuareg desert-blues artists making names on the international circuit, like Bombino and Tamikrest, whom appeared on the Roy Thomson Hall patio in 2015. Touring internationally the band began to win over fans among rock and roll royalty, leading to many accomplishments: Invitations to play with greats including Carlos Santana, Robert Plant and his guitarist Justin Adams; Thom Yorke has said that his song “The Clock” was a direct result of hearing Plant’s recording of the band. They appeared on Herbie Hancock’s Grammy Award-winning 2010 album The Imagine Project. 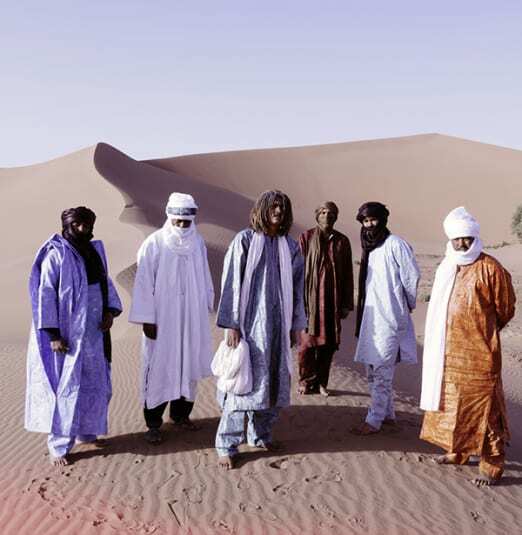 In 2012 Tinariwen’s album Tassili (featuring Nels Cline, The Dirty Dozen Brass Band, and members of TV on the Radio) won a Grammy Award for Best World Music Album. The band’s eighth album, Elwan was recorded in two distinct bursts: In 2014, the band set up shop in Rancho de la Luna studios in Joshua Tree, California along with guest musicians Matt Sweeny (Johnny Cash, Bonnie Prince Billy and Cat Power), Kurt Vile, Mark Lanegan (Screaming Trees, Queens of the Stone Age) and Alan Johannes (Queens of the Stone Age), and engineer Andrew Schepps (Red Hot Chilli Peppers, Johnny Cash, Jay Z). Two years later, the band set up their tents on a Moroccan oasis near the Algerian border with young local musicians and a group of Berber Gnawa (spiritual trance) musicians. Special guests Dengue Fever’s music is a cross-pollination of Khmer rock, garage rock, psychedelic rock and the British Invasion. 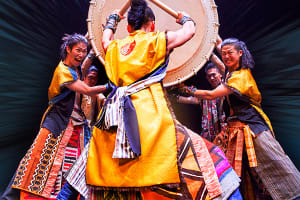 The LA-based band is fronted by Cambodian-born award-winning vocalist Chhom Nimol, and has, since their 2003 debut, hit major festivals and venues around the world and garnered serious acclaim. "By making the geographically distant feel welcomingly familiar, Tinariwen have made Elwan a can't-miss release for curious audiences from all corners of the globe." — Kyle Mullin , Exclaim!